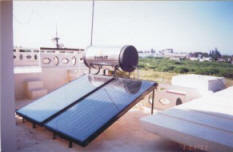 The system consists of flat plate solar collector and highly insulated water tank. The collector is designed such that the cold water entering is heated up when sunshine falls on it. 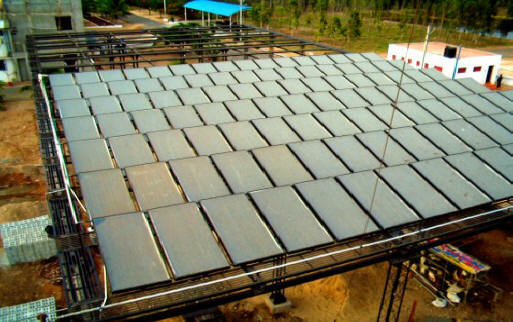 The heated hot water moves up and stored in the insulated water tank due to the decrease of density, the fresh water reaches the solar collector by thermosyphoning (Natural Flow). 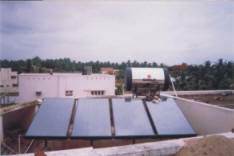 This process carries automatically till the sunshine is available. 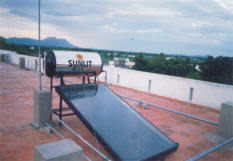 The hot water stored in the tank will have a heat retention for three days.